NEW BRITAIN - JoJo Cooper’s jumper with 0.4 seconds left - his only points of the second half - lifted Wagner to a 64-62 victory over Central Connecticut State on Thursday night at Detrick Gymnasium. After Deion Bute scored for Central Connecticut with 7.1 seconds remaining, Cooper took the inbounds pass, dribbled downcourt and hit his jumper from the left elbow. Cooper finished with 13 points for the Seahawks (21-7, 14-3), who had already clinched the Northeast Conference title and have won 10 of their last 11 games. The Blue Devils (13-17, 6-11) led 34-31 at halftime, but Saunders hit a 3-pointer for the first points of the second half, Liggeons scored and Wagner stayed ahead until Bute’s game-tying basket. Joe Hugley scored 17 points and Austin Nehls had five 3-pointers for his 15 points to lead CCSU. 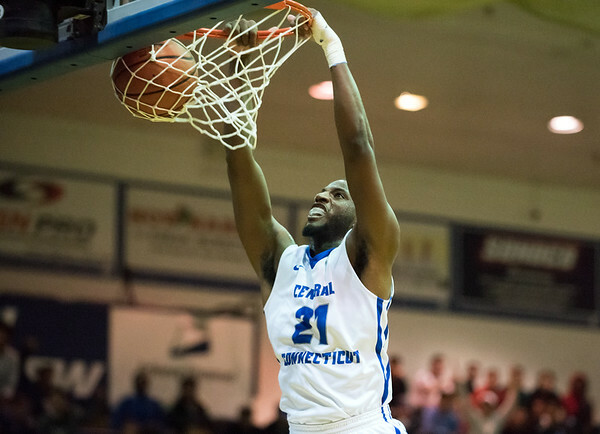 Central closes out the regular season on Saturday against St. Francis Brooklyn at 3:30 p.m.
Posted in New Britain Herald, CCSU on Thursday, 22 February 2018 22:34. Updated: Thursday, 22 February 2018 22:37.